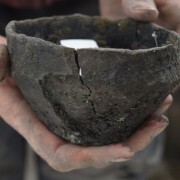 Alongside the fantastically preserved objects and timbers from the site we are also finding other evidence of the people who lived at this settlement. In multiple areas preserved footprints are emerging from the river sediments providing us with another opportunity to gather information about movement and activity. Footprints are a relatively rare find and represent an “archaeology of absence” that helps to make the connection with the Bronze Age that little bit more tangible. We aren’t just encountering the artefacts and dwellings of the families here: we are seeing the results of them paddling around the settlement. We encounter footprints in various areas of the site and are able to separate some out into differing time periods. 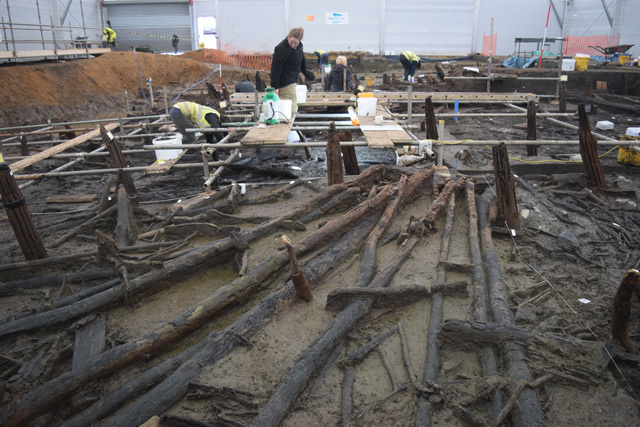 The timber causeway of the settlement is currently our earliest dated element with felling dates close to 1290BC. In the fairly soft roddon silts surrounding the causeway are hundreds of impressions, which seem to predate the construction of this walkway. 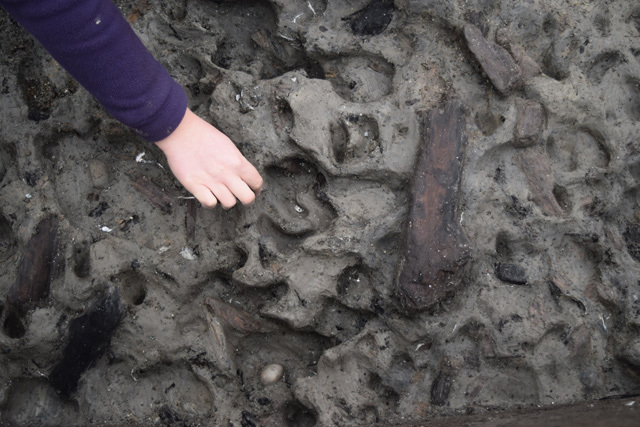 Animal and human prints being excavated in the roddon silts in the area surrounding the timber causeway. 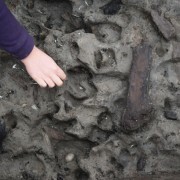 These roddon footprints are found on the banks of the river channel the causeway crosses and the settlement is eventually built over. It is important to note that the depth of the water of the river would have varied seasonally, becoming drier and shallower over the summer months. Much of Fenland is a wet, boggy environment creating ideal conditions for the preservation of footprints. So, as people walked through this landscape, likely using routes that would become more formalised by the construction of causeways, their footprints were left behind. The silts of the roddon are very clay-like and retain the indentations created by feet and hooves remarkably well. As the river came to flow over them, shell-rich sediments settled within them, ensuring that their shape and depth was preserved. This process also makes life much easier for us when we come to excavate them, we carefully remove any remnants of the shell onto a clean, dark grey sediment leaving us with the original print. However, it is a time-consuming and delicate procedure requiring a lot of patience! Footprints emerging around the exterior of the palisade, likely tied to its construction. We also have later footprints in the vicinity of the palisade, exclusively around its exterior. These were formed in a similar manner, but are pressed into soft river sediments rather than the grey roddon silt. 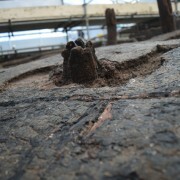 The close link to the palisade suggests they are connected to its construction and were formed as people were sharpening the ends of posts and driving them into position. The presence of large numbers of ash woodchips nearby is also a good indicator of the construction process happening in place. There is a nice degree of variety to the prints, ranging from people to a number of animals. We have hoof prints from cows and pigs which are especially clear in the grey, roddon silts near the timber causeway. The human footprints are also very interesting. A plaster cast taken of one in 2006 equated to a modern UK size 9 shoe: which is hardly small! The cast also indicated that the foot was not bare and had a covering, although it was difficult to get detail from the impression. We’re recording the areas of footprints using photogrammetry: a technique that is ideally suited to their very 3D nature. As the excavation progresses and we explore more of deposits immediately outside the palisade and around the timber causeway, we will undoubtedly find many more footprints. We are particularly interested in seeing if the density of the footprints changes as well as the ratio of animal to human prints. 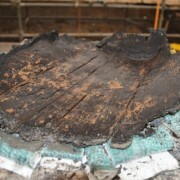 It is another fascinating aspect of the project that survives thanks to the excellent preservation conditions on site. The footprints around the outside of the palisade and timber causeway show that people were walking around the landscape and the river channel the settlement is built on. But how do we know that the buildings were stilted rather than traditional roundhouses constructed on the ground? As we’re progressing with the excavation we are slowly getting more evidence that supports our idea that the homes were stilted above the river. 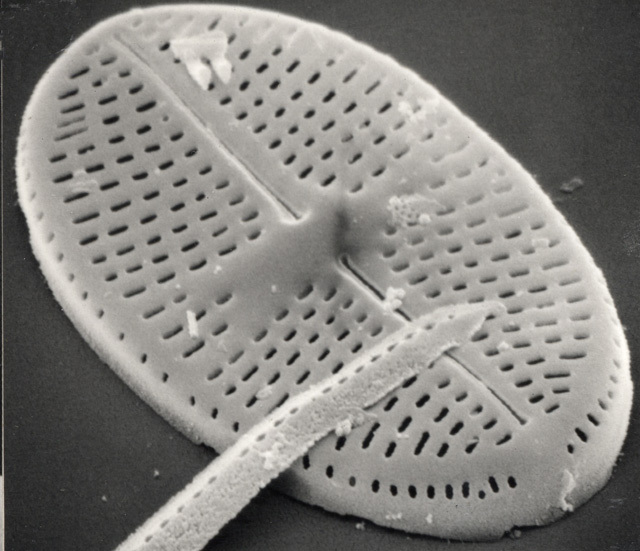 Scanning electron miscroscope image of an Achnanthes diatom, courtesy of Nigel Cameron. Data from our environmental specialists is beginning to come back and these show that the river channel was always present and never dried out. Examining types of algae, notably Achnanthes diatoms, indicate the river was relatively shallow and moved slowly. Equally, micromorphology results show that none of the sediment shows signs of compaction typically associated with a floor layer within a house. 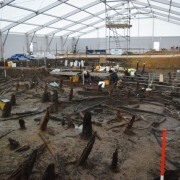 The timber causeway is also helping to play a part in our understanding of the buildings. The largest oak timbers in the causeway have been dated to roughly 1290BC, before the dwellings were constructed. The footprint of RH5 is directly over the line of the timber causeway. If this house was not raised up above the water, then the large oak uprights of the causeway would have stuck up through the floor of their home. 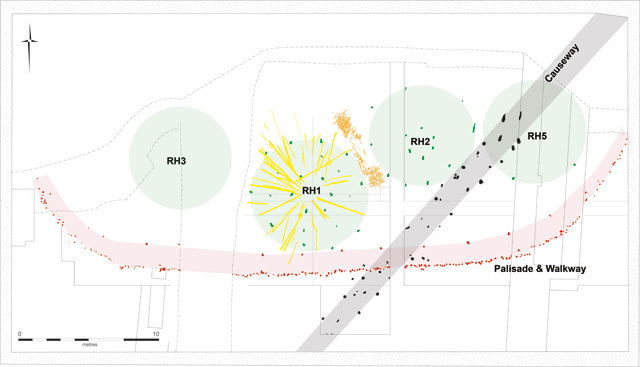 Simplified site plan showing that RH 5 is built over the earlier timber causeway (highlighted in grey). 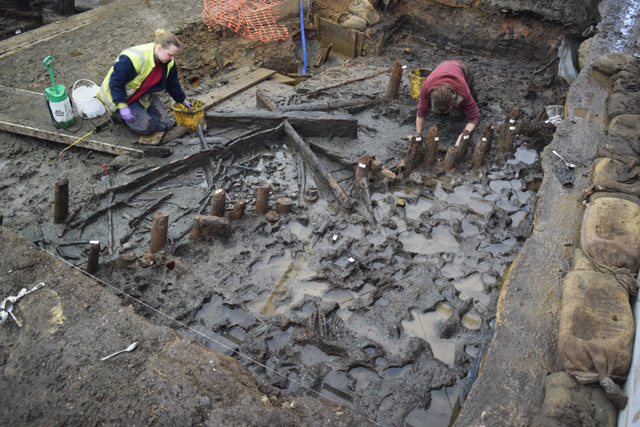 However, one of the most significant elements is the sheer depth that these timbers have been driven into the bottom of the river channel. When we find Bronze Age roundhouses on dry ground, the postholes we encounter are only 30-50cm deep at most. Yet, the oak uprights of the houses at Must Farm go down metres. A rough guideline in archaeology is that approximately one third of the post would have been driven into the ground, with the remainder protruding above. This gives a good idea of the height of these buildings with the wooden “stilts” clearing the water of the river channel. If these posts were not used as supports for a raised house, then why were they driven so far into the sediments of the river channel? 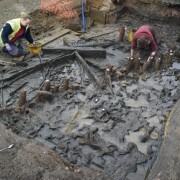 One of the queries we are commonly asked about the posts across the excavation is “why are they all the same height?”. It’s a very interesting point, as it is unlikely in the Bronze Age that the timber causeway posts, building uprights and the palisade were all the same height: yet they are now. The most likely reason for this phenomenon is tied in with wood preservation. 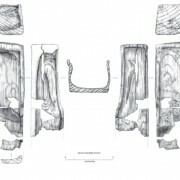 Image showing the very similar heights of different uprights. For wood, or most organics, to survive there needs to be either waterlogged or very dry conditions. 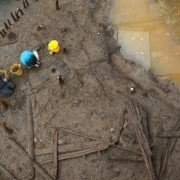 The lower portion of the timbers would have been permanently under the water of the river. The upper sections, closest to the floor of the house would have been largely dry all year round. However, the central sections of the posts would have been damp, especially given the changes in the depth of the river tied to the seasons. These damp conditions would have caused all the posts in the river to decay at a similar height, leaving only the lower sections in situ. We may come across the upper sections, that were once largely dry, which fell into the water and then became waterlogged. Successfully matching these with the corresponding lower section will likely be nearly impossible, but there is still a small chance we may be able to. Over the coming weeks of the project, we’ll further refine our understanding of the buildings as we record more of the structural timbers. 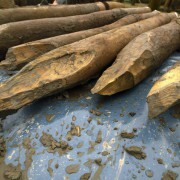 Similarly, as the excavation concludes and we start to get results during the post-excavation phase, our knowledge of the river channel and its environment will significantly increase. 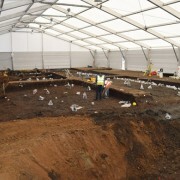 Get the answers to the most commonly asked questions about the Must Farm site and excavations.